Vince Carter won what is arguably the best dunk contest ever back in 2000, and was full of highlights throughout his career. However, in his twilight years, Carter doesn't fly nearly as high. He only had 15 dunks this season, each one costing the Mavs $212,000. Dirk Nowitzki had just two more offensive rebounds than Monta Ellis. Dirk is listed at 7'0″ and Monta Ellis is 6'3″. Each offensive board for Dirk cost Dallas $568,035; meanwhile, every time Ellis grabbed a rebound, it "only" cost $210,526. Javale McGee and Danilo Gallinari made a combined $20,896,925 to play five games total. JJ Hickson earned $34,333 for every free throw he made, and $36,785 for every free throw he missed. Kenneth Faried led the Nuggets in scoring with 1,096 points. Ty Lawson was second with 1,090, and Randy Foye was third with 1,068. Foye made a little more than twice what Faried made, and Lawson earned almost two and a half times what Foye and Faried made combined. The Splash Brothers are two of the best shooters in the NBA, and were 1-and-2 in the league in three-pointers made, but their efficiency comes at radically different prices: each one of Steph Curry's threes cost the team $37,884, while Klay Thompson's treys were a relative bargain at $10,394 apiece. Every successful attempt for Dwight Howard cost the Rockets $58,777; James Harden made a lot more for the bargain price of $23,787 apiece. In fact, Howard missed exactly 200 more free throws than Harden while attempting 27 fewer from the line. All of this is a long way of saying Dwight Howard is not good at shooting free throws. Chandler Parsons earned $756 per point scored. Cliff Paul is all about assisting people, and his brother Chris isn't too bad, either, doling out 663 assists during the season. Each one earned the family $28,158. Lob City is fun to watch, albeit pricey: every Blake Griffin dunk (none of which were over a KIA) cost the Clips $93,418, while each DeAndre Griffin slam was worth $44,843. Griffin also got his money's worth in technical fouls–he was tied for the lead league with 16. If he got fined 1/16 of his salary for each one, it'd cost just under $1.03 million. Kobe Bryant made $371,388 for each game he DIDN'T play last year. Every minute he was on the court, he earned $172,555. On the other side of the backcourt, Steve Nash pocketed $113,421 for each game he wasn't on the court. Nick Young earned a cool $1.1 million each time he celebrated a missed three-pointer. Zach Randolph cashed in $22,390 every time he snagged a rebound. Marc Gasol, sharpshooter extraordinaire, netted $7,430,262 for each successful attempt from beyond the arc. Ricky Rubio led the league in steals and was second in the NBA in assists. He made $20,954 for each steal, and earned $5,693 per assist. Kevin Love was tops in the NBA with 65 double-doubles–each one cost the Timberwolves $226,060. His triple-doubles were a bit more valuable, clocking in at just under $4.9 million apiece. The best free throw shooter in the NBA, Brian Roberts hit a blistering 94% from the line. At his salary, each make was a bargain at $6,311. On the other end of the spectrum, Tyreke Evans missed almost five times as many threes as he made. Every successful attempt cost the Pelicans $490,476. Kevin Durant was a free-throw machine in 2013-14, making 127 more than any other player in the NBA. Each successful trip to the line earned the Slim Reaper $25,366. Russell Westbrook led the league in turnovers per game. 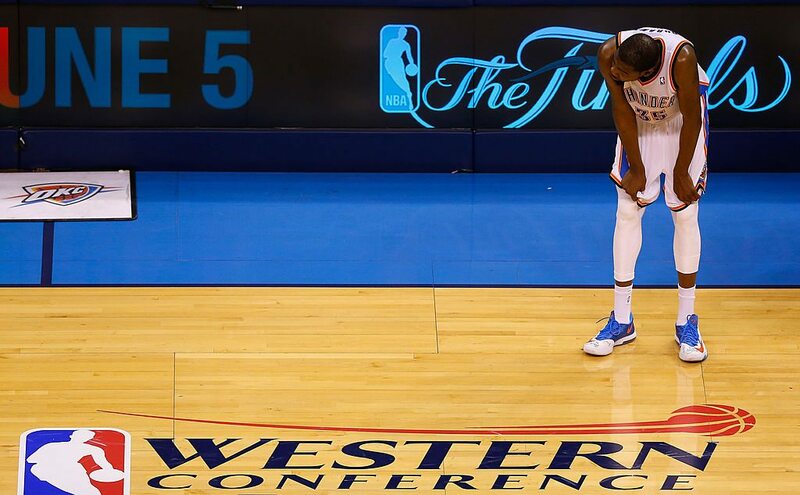 His recklessness cost the Thunder $47,895. Emeka Okafor made $14.8 million last year, despite not playing a single minute for the Suns. Goran Dragic earned $7.5 million while averaging 20 points, 6 assists and being snubbed for the All-Star game. That makes sense. Marcus and Markieff Morris are twin brothers who seem to get a lot better when they're together. Kind of like the Power Rangers. For every extra point Markieff scored that Marcus didn't, he earned $328. The Trailblazers had the same starting lineup for 69 games during the regular season. The other 13 games? Dorell Wright earned himself $230,769 every time he filled in for LaMarcus Aldridge. Robin Lopez earns just under $2 million for each extra inch of height his hair gives him. DeMarcus Cousins was a beast last year, averaging a shade under 23 points and 12 rebounds a game. And it came at a relative bargain: each point was worth $3046, and each board was worth just about double that, at $5917. Jason Thompson made $22,485 for every foul he committed. The NBA Champs Spurs exemplify the phrase "team basketball", so it's only fitting that everyone got to shine at some point during the year–San Antonio had 17 different players start in a game last season. The "starter" with the fewest minutes? Othyus Jeffers, who saw the court for only 34 minutes all year, but still earned $1,530 for each one. The team's top three performers from three-point range: Marco Belinelli, Patty Mills and Danny Green. Belinelli earned $9386 per attempt, Mills made $3,503 per shot, and Green pocketed $11,832 for each trey he put up, proving there's power in being third-best on your team at a certain skill. Andris Biedrins made $1.5 million every time he actually played in a game. And always the strong free throw shooter (16.6%), he cashed in $9 million per successful attempt. Alec Burks made $244,667 for each heave he had from beyond halfcourt. He made zero of them. If only those fan halfcourt shots during timeouts worked that way.